Kidney beans are often recommended as a protein source for vegetarians, but their other main benefit is as a source of healthy carbohydrate. 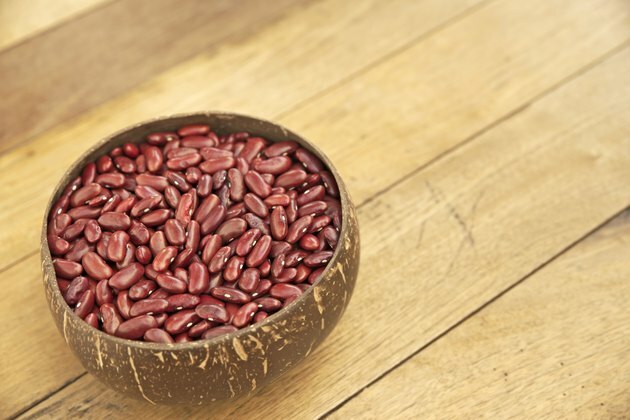 When including kidney beans in your diet, it's important to know not only their carbohydrate content but also the type of carbohydrates they contain. The amount of carbohydrates in kidney beans depends on whether you buy your kidney beans dry or canned. A 1/2-cup serving of canned kidney beans weighs 116 grams and contains 14 grams of carbohydrate. A 1/2-cup serving of dry kidney beans weighs 86 grams and contains 20 grams of carbs. The main type of carbohydrate in kidney beans is starch. Starch is a complex carbohydrate that takes the body longer to break down than simpler carbs and forms an important part of a healthy diet. Around 2 grams of the starch in 1/2 cup of kidney beans is resistant starch. Resistant starch provides numerous benefits, including improving your cholesterol levels, helping you feel full and boosting your immunity, according to nutritionist Ryan Andrews. Around 5 grams of the carbohydrate in each 1/2 cup of kidney beans comes from fiber. Adequate fiber intake is crucial for maintaining your general health. The American Heart Association recommends aiming to eat at least 25 grams of fiber each day. The benefits of a higher fiber intake include a lower risk of heart disease and increased feelings of fullness, which may help curb your calorie intake and aid weight loss. All types of beans have a similar carb content and many of the same nutritional benefits as kidney beans, so your best bet is to eat a variety. For a comparison, though, canned black beans contain 20 grams of carbs and 7.5 grams of fiber per 1/2 cup, pinto beans have 24 grams of carbs and 5 grams of fiber per 1/2 cup, and the same amount of garbanzo beans, or chickpeas, contains 16 grams of carbs and about 5 grams of fiber. Precision Nutrition: Resistant Starch: What Is It? And Why Is It So Good for You?